Samsung has been turning out some excellent smartphones that are packed with features and dressed to the nines, but which of the latest Galaxy phones is the right one for you? This year’s flagship trio is seriously tempting, and there’s a lot of overlap in terms of functionality, but there are also some important differences. Let’s take a closer look at precisely what sets the Galaxy Note 9, Galaxy S9 Plus, and Galaxy S9 apart and see if we can pick a winner. All three of these phones boast Qualcomm’s current top of the line processor in the shape of the Snapdragon 845. That means silky smooth performance and power efficiency. Where things start to differ is the Note 9’s use of a water carbon cooling system to keep temperatures running low, so you can game for a longer period of time. The amount of RAM is also improved on the Note 9. The Galaxy S9 makes do with 4GB, which is enough RAM for most people. The S9 Plus and the Note 9 offer 6GB of RAM, which will be appreciated by multi-taskers, but you can also get a version of the Note 9 with 8GB of RAM. You can pick up the S9 or S9 Plus with 128GB or 256GB of internal storage, but the base models of the S9 and S9 Plus make do with 64GB. The base model of the Note 9 starts with 128GB, and there’s also a 512GB variant (the one with 8GB RAM). They also all support expansion via MicroSD card. Fast charging via Qualcomm’s Quick Charge 2.0 standard and support for Qi wireless charging is universal here, but battery capacity varies widely from 3,000mAh in the S9 to 3,500mAh in the S9 Plus all the way up to 4,000mAh in the Note 9. The extra RAM and battery capacity give the Note 9 an edge here. With all three phones featuring Samsung’s curved Infinity Display, with glass backs and a metal frame, it’s clear these devices belong to the same family. However, the Note 9 is a little taller, wider, thicker, and heavier than the other two. The S9 and S9 Plus also look a bit more rounded, particularly from the front, while the Note 9 is slightly more angular. What you prefer will depend on your needs and possibly your size. There’s no doubt that the Galaxy S9 is the easiest to handle, but you do sacrifice some screen size, battery life, and even a few features by opting for the smallest phone. All three have beautiful, if familiar, designs, but we suspect the Note 9 will be a bit too big for some. On the durability front, all three phones score an IP68 rating which means they can be submerged in up to 1.5 meters of water for up to 30 minutes without damage. Despite the fact they all boast tough Gorilla Glass 5, it’s advisable to snag a case if you want to avoid drop damage. The Super AMOLED displays that Samsung uses are top notch. All three boast a sharp 2,960 x 1,440-pixel resolution with an 18.5:9 aspect ratio. The Note 9 is the biggest of the bunch at 6.4 inches, while the S9 Plus display is 6.2 inches, and the S9 display is 5.8 inches. The bigger screens have a slightly lower pixel density because of the extra size, but you’ll have trouble telling these displays apart and they’re all excellent. The Galaxy S9 is the odd one out here with a single 12-megapixel lens in its main camera, though it does boast a variable aperture that can go from f/1.5 to f/2.4 to get the best shot depending on conditions. 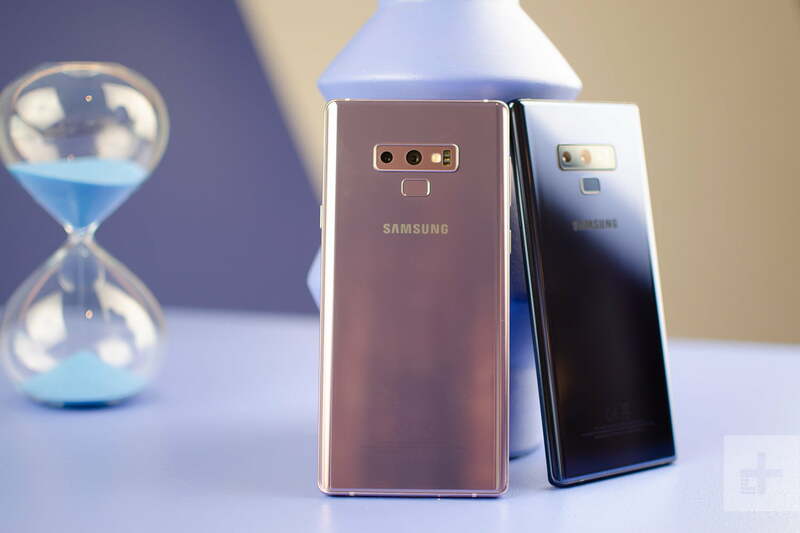 The S9 Plus and Note 9 pair that lens with a second 12-megapixel lens with an f/2.4 aperture that enables 2x optical zoom. We’ve been impressed by what you can do with the S9 Plus camera and the hardware in the Note 9 appears to be identical, so we’d expect similarly great things, including excellent low-light performance. The 8-megapixel front-facing camera is the same in all three phones. They’re also all capable of shooting super slow motion footage and capturing 4K video at 60 frames per second. Samsung has added artificial intelligence scene recognition to the Note 9 to identify 20 different scenes and set contrast, exposure, white balance, and color for optimal results. There’s also a new Flaw Detection feature that will alert you if something happened to ruin a shot, such as a subject blinking or a smudge on the lens. We need some time to test these features out and see how well they work, but we won’t be surprised if they come to the S9 and S9 Plus as well via a software update. You’ll find Android 8.0 Oreo with Samsung’s Experience user interface on top on all three of these devices. There are a few extras on the Note 9 designed to serve the S Pen, but for all intents and purposes the software is going to feel identical whicever you choose. We fully expect all three phones to get the Android 9.0 Pie update and the Android Q update on a similar schedule, so it’s difficult to separate them here. Samsung has always been generous in the special features department and so you’ll find these three phones offer all sorts of extras including A.I. assistant Bixby, support for virtual reality with Samsung’s Gear VR headset, and the ability to use your phone as a desktop computer, though the S9 and S9 Plus require Dex Station or Dex Pad to dock whereas the Note 9 only needs a USB Type-C to HDMI cable. The obvious standout here is the S Pen, which only the Note 9 has and it has been beefed up considerably compared to previous versions. With Bluetooth Low Energy support you can now use the S Pen to control your phone from up to 30 feet away. You can use it to snap a photo, skip a music track, and more. It does require power, but just 40 seconds in the Note 9 will give it enough charge to go for 30 minutes. You can also still use it to sketch or take notes, including screen-off memos. The Samsung Galaxy S9 and S9 Plus are widely available right now. You can buy them unlocked direct from Samsung or other retailers, and you can pick them up from all the major carriers. The S9 starts from around $670 right now and the S9 Plus can be found for as low as $820. Samsung is charging $1,000 for the 128GB Note 9 and an eye-watering $1,250 for the 512GB and 8GB RAM model. You can pre-order it starting from August 10 and it will land in stores on August 24. It will also be supported by all the major carriers. The Note 9 scrapes a win overall here, but with caveats. All it really offers over the S9 Plus is the S Pen, A.I. in the camera, and some extra battery capacity. If you’re not interested in the S Pen we think the more svelte and cheaper S9 Plus is a better bet. Both the S9 Plus and Note 9 really benefit from the second 12-megapixel lens in the main camera, and they also boast more stamina and RAM than the Galaxy S9, but the gap between Samsung’s biggest smartphones is extremely narrow.